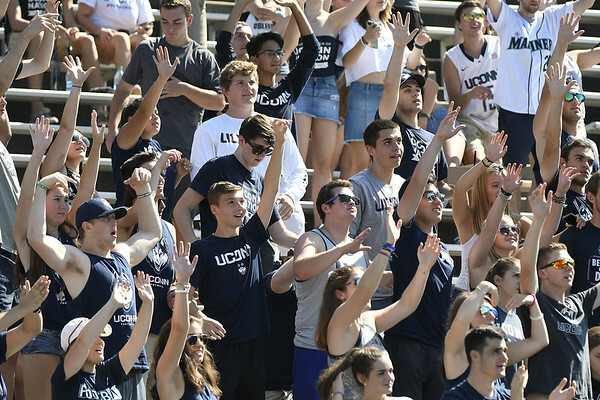 NEWPORT, R.I. - For the University of Connecticut, how many people show up for its home football games this season is perhaps more important than how many wins the Huskies compile on the field. Those two things are of course often linked, and the Huskies’ recent downturn in results is a major factor in the declining attendance at Pratt & Whitney Stadium. But the school has tried to make a push to get fans into the seats in East Hartford this season - not to mention in Storrs and Hartford for basketball games - with a summer of public events and pleas. That isn’t necessarily, or at least exclusively, head coach Randy Edsall’s responsibility. But he understands the economic bind his school is currently in as it tries to compete for victories, and dollars, at college football’s highest level. “I get the big picture. I mean this in a positive way, people just need to come out and enjoy the game. We’ll be better. But when we first started this thing, we weren’t winning and people were there,” Edsall, who is about to begin the second season of his second stint as UConn’s head coach, said this week. Attendance at the Huskies’ home games has declined each season since 2010 except one but last season it took a major dip. UConn drew an average of just 20,335 fans per game at the 40,000-seat stadium still commonly referred to as The Rent. That’s a drop of more than 6,000 fans from the previous season and roughly half of what the average was during the heyday of Edsall’s first stint here. Playing in a conference that doesn’t feature many of its former northeast rivals has clearly impacted attendance to some degree. Having not finished any of its last seven seasons with a winning record is also a major culprit. And the fact that the American Athletic Conference doesn’t distribute money in anywhere close to the amount that bigger leagues do, UConn’s dearth of ticket sales is compounding its financial predicament. The number of victories in a previous season sometimes correlates directly to the number of backsides in the seats for the following season. It’s not always as simple, however, UConn Athletic Director David Benedict points out. “They’re two different issues. Obviously, typically when you win, the people come. I don’t think that would be any different in Connecticut than in most places,” Benedict said this week during the American’s Media Day in Rhode Island. Fans who clamor that UConn isn’t exactly big-time anymore in football as an excuse to stay away from games are the same ones who are in some ways at fault for the Huskies’ demise. Benedict has tried this summer to do that, taking Edsall and a number of other head coaches from his department on a bus tour of the area. Because the Huskies open the season Aug. 30 against Central Florida, the self-proclaimed national champion from last season, perhaps there is reason for Benedict to be optimistic about the attendance. “I would hope so. It certainly is a quality game. We’re going to be the first team to play them since they had their undefeated season,” Benedict said. Posted in New Britain Herald, UConn on Thursday, 26 July 2018 20:53. Updated: Thursday, 26 July 2018 20:55.